At least you should be able to make it look right and not half assed. I wasn't sure if you were keeping a trunk lid on it or not. I'm still wondering what motor this is gonna be running. Last edited by 270SE; 09-02-2010, 08:20 PM. Yea he has always been partial to peddel cars LOL. As far as the bed, I vote for making it water tight with drain plugs. Could serve double duty as an ice chest or swimmin pool hehehehehe. All kidding aside, I have known about this for a while and it was very hard to keep quite about it because it is such a cool idea! I love the fact that the package tray is big enough to give you room for the nitrous bottles behind the seats hehehehe. Naaaa Gotta be an old one. 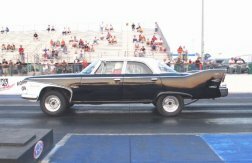 My vote is for a Desoto Hemi with twin hair dryers and a 6 speed. Maybe even a 2 speed axle. That should be able to give it enough grunt to get out of the driveway. Or extend the nose and add another slanty for an inline 12. Of course he would need a CDL for someting that long LOL. Now that's interesting. That would be a sight to come to an event with Fugly in tow. Thats a damn good idea for a tow rig..
Are you going to dig up a tail gate from a wagon for the rear or leave it gateless?